Who Will Stand Up to Obama Now? This articleby Jeffrey St. Clair is re-posted from CounterPunch. Barack Obama is a technocrat and he just won a technocratic victory. His reelection campaign, lacking any kind of arching philosophy or defense of his own disturbing tenure as president, became a bland exercise in political calculus, targeting individual precincts, swing counties and fractionated demographic sectors. 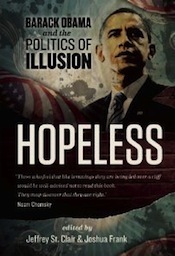 Obama’s victory, at the cost of $2 billion, is about as thrilling as completing a game of Sudoku. Obama was propelled to his slender popular vote win by those that the Republicans almost ritually abused: women, blacks, gays and Hispanics. Ironically, these are people that the Obama administration has also ruthlessly strafed for four years. But Obama smiled as he cut the lower-classes adrift in the midsts of a cratering economy, while Romney expressed only contempt for them. Mitt Romney ran an inept campaign. As a candidate, he was even more aloof, arrogant and emotionally distant than Obama. If Obama’s campaign lacked any unifying message, Romney’s resembled a kind of political Brownian Motion of constantly drifting themes in a tank of rancid and racially-charged sludge. He doomed his chances with his peculiar choice of Paul Ryan as his running mate, who personified the budgetary cruelties of the Republican right and alienated aging white voters who otherwise might have wandered into his camp. Where does Obama go now? The House remains firmly in the hands of militant right-wingers. The Senate will continue to be paralyzed by the filibuster-happy minority and a spineless Democratic majority. Stalemate? Probably not. Second terms are almost always about polishing a presidential legacy, already being harped upon by the withered likes of Tom Brokaw. Obama will be desperate for some signature legislative victories. So what to expect from Obama? An aggressive new plan to combat climate change? A real federal jobs program aimed at full-employment? Liberalization of immigration policies? Decriminalization of marijuana? Deep cuts in the defense budget? Rollback of the Patriot Act? A ban on assassinations by drones? Movement toward single-payer health care? Sure. No. Clinton will be his template: the Clinton who pushed for the elimination of the Glass-Steagall Act, the gutting of welfare and the war on Serbia. Obama will pursue bi-partisanship with a vengeance. Obama has always been a committed neoliberal, a closeted agent of austerity. Now he no longer needs to even play-act for his political base. He can openly betray their interests. In a few months, the president will reach out to his old pal Paul Ryan to take a stroll across that tragic terrain known as the common ground in pursuit of those twin obsessions of the elites: deficit reduction and entitlement reform. In the name of political conciliation, Obama will piously move to slash away at Social Security, Medicare, Medicaid and the last frail fabrics of the federal social welfare programs. These savage cuts will be enthusiastically cheered by the mainstream press, Wall Street and the Washington establishment. Who will stand up to challenge him? That is the real question posed by this enervating election.